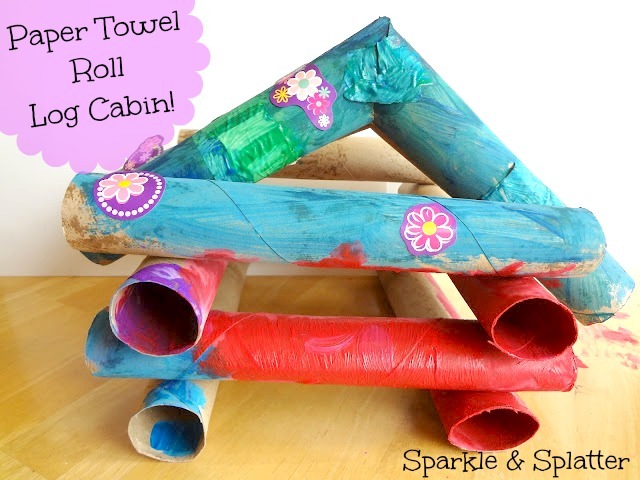 Here is a fun house you can make with paper towel rolls! A great way to recycle and re-purpose those empty cardboard tubes...try this instead of tossing them in the trash. Empty paper towel tubes (you can make a smaller house if you want out of toilet paper tubes too). For the house shown we used 14 tubes. You can make a bigger or smaller house by adjusting the number of tubes used. Embellishments (optional): stickers, glitter, feathers, pom poms, etc. Here's the top view looking down...let dry for a few hours or overnight. Repeat for the other tubes, and bundle them together and tape as shown. The masking tape looks kind of messy at this point, but that's OK, it will get hidden under the paint. Here is the house with the roof on...we left our roof unattached to the base so that we could put things in it while playing with the house. Paint to your heart's content, then embellish with stickers, gems, etc. If you save enough paper towel rolls, you could make a whole town! Great! We had a lot of fun making ours!